It’s more important than ever for brands to stay current, but news moves at such a rapid pace that it can be tough to know which topics are worth incorporating into client work. How do you know if something is worth utilizing in your social strategy or media plan? And if you do decide to reference a current event, what are the benefits of mentioning it and the risks of overstepping? At Trevelino/Keller, we understand the power that news can have in client brand presences. So, we look for ways to link what is happening around us to our work, but staying selective about what we incorporate is key. We seek cultural references that are interesting, timely, and widely relevant – like the recent closure of part of I-85 in Atlanta. Even if you don’t live here, you’ve probably heard that a portion of the interstate collapsed a couple months ago. The news made national headlines and caused a panic among Atlantans, as traffic is already a constant complaint. The bridge’s collapse was said to affect about 243,000 commuters every day. With a number like that, it was obvious that this event would impact not only our clients but also their customers and audiences. Luckily, no one was hurt in the collapse, and the bridge reopened within a few weeks. With word of its impending reopening, our teams went straight to work to create strategies that would speak to our brands, their industries and their audiences. Publik Draft House, a local Atlanta restaurant and longtime client, offered appetizers for $1.85 as a thank-you to the people who worked so hard to complete the bridge on time. Our team members worked hard to earn coverage from local and industry outlets, and the promotion quickly picked up buzz. Before long, word of the restaurant’s offer was picked up by the Atlanta Journal-Constitution and Eater Atlanta. Meanwhile, the Swift Transportation team took a different approach to the good news. 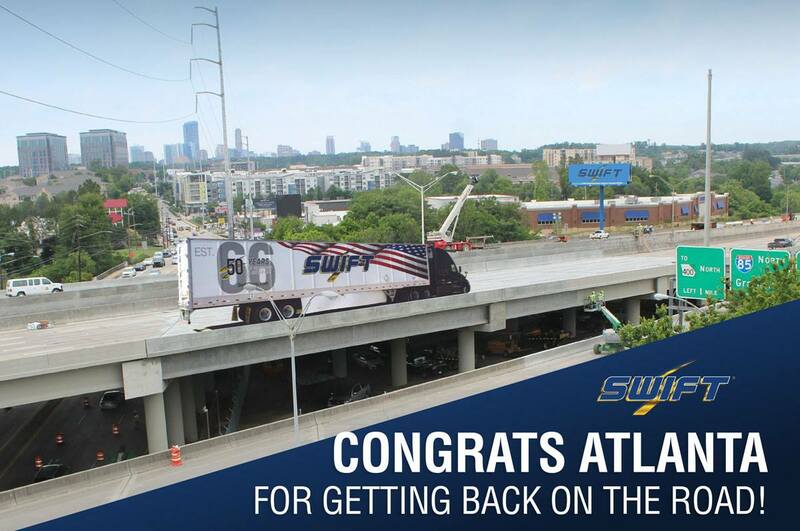 Our team created an image for social media, featuring a Swift truck driving over the new I-85 bridge, to honor the “swift” turnaround by the Georgia Department of Transportation and the City of Atlanta. T/K also got Staymobile into the act with a media alert, which announced tempered glass for $8.50 and picked up coverage from 11Alive. These promotions and images were simple, but they were effective because the I-85 re-opening was such a hot topic across the city. As long as the client’s voice and messages are maintained, integrating current events into their work can mean big payoffs.